a manifest deviation of an eye from the normal position when both eyes are open and uncovered; see also strabismus. Abnormal deviation of the eye. See: strabismus. Abnormal deviation of the eye. The condition in which the lines of sight of the two eyes are not directed towards the same fixation point when the subject is actively fixating an object. Thus the image of the fixation point is not formed on the fovea of the deviated eye and there may be diplopia, although in most cases the diplopic image is suppressed and vision is essentially monocular. The prevalence of concomitant strabismus in children is 2%-5% and is far more common than paretic strabismus. Management depends on the type of strabismus. However, in all cases the refractive errors must be accurately corrected. If the deviation still prevails, orthoptics and, sometimes, pharmacological (e.g. miotics in accommodative esotropia) treatment is attempted but in many cases surgery is necessary (except where accommodation is faulty or when the deviation is small), usually followed by some orthoptics treatment aimed at developing fusion and stereopsis. Syn. heterotropia; squint (this term is commonly used by the general public); tropia. See angle of anomaly; angle of strabismus; botulinum toxin; chemodenervation; deviating eye; fixating eye; hypertropia; Bruckner's method; Hirschberg's method; Javal's method; Krimsky's method; microtropia; phi movement; zero point; past- pointing; abnormal retinal correspondence; suppression; Apert's syndrome; Brown's superior oblique tendon sheath syndrome; Crouzon's syndrome; Duane's syndrome; Marfan's syndrome; cover test; three-step test; theories of strabismus. accommodative strabismus Convergent strabismus resulting from abnormal demand on accommodation due to an uncorrected hyperopia accompanied by excessive convergence and insufficient relative fusional divergence. The AC/A ratio (accommodative convergence to accommodation) is normal but the child has high hyperopia (refractive accommodative esotropia). It may also occur in cases in which the AC/A ratio is high and accommodation is accompanied by excessive convergence in a child with a very small amount of hyperopia (non-refractive accommodative esotropia). Accommodative strabismus is usually an acquired deviation first presenting in the first decade of life. Children do not usually notice diplopia, but instead develop suppression and later amblyopia. Management consists of full hyperopic correction and amblyopia treatment. Syn. accommodative esotropia. See cycloplegic refraction; acquired non-accommodative strabismus. acquired strabismus An abnormal alignment of the visual axes that occurs after the age of six months. 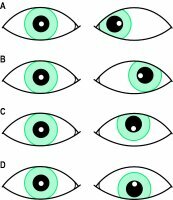 acquired non-accommodative strabismus Convergent strabismus that presents after normal ocular alignment has been established and is not related to a subject's accommodative effort. Treatment is usually surgical. Syn. acquired non-accommodative esotropia. alternating strabismus Strabismus in which either eye may deviate. See unilateral strabismus. angle of strabismus See angle of deviation. apparent strabismus Condition simulating the appearance of strabismus. It may be due to epicanthus, to an abnormally large angle lambda (or kappa), or to the breadth of the nose, etc. It can be distinguished from a real strabismus by noting that the corneal light reflexes are centrally located in relation to the pupils, or by means of the cover test. Syn. pseudostrabismus. comitant strabismus See concomitant strabismus. concomitant strabismus Strabismus in which the angle of deviation remains the same whichever eye is fixating and in whichever direction the eyes are looking. Syn. comitant strabismus. See concomitance; incomitant strabismus. congenital strabismus See infantile strabismus. consecutive strabismus A deviation of the eye in the opposite direction to what it was previously. This condition may follow surgery although it may occur spontaneously. There are two types: consecutive exotropia in a patient who previously had esotropia or esophoria and consecutive esotropia in a patient who previously had exotropia or exophoria. Syn. postoperative over-correction. See divergent strabismus. convergent strabismus Strabismus in which the deviating eye turns inward. This is the most common type of strabismus in children. The principal categories are accommodative strabismus and non-accommodative strabismus (Fig. S15). Syn. crossed eyes (colloquial); esotropia (SOT, ET, esoT). See A pattern; V pattern; Swann's syndrome; prism adaptation test. cyclic strabismus A very rare and unusual form of strabismus occurring on a 48-hour rhythm in which a 24-hour period of normal binocular vision is followed by 24 hours of manifest heterotropia. The condition, which may have started in early infancy, only becomes apparent during early childhood. With time, cyclic heterotropia tends to become constant. Syn. cyclic heterotropia. divergent strabismus Strabismus in which the deviating eye turns outward (Fig. S15). Syn. exotropia (XOT; XT; exoT). The principal categories are constant exotropia and intermittent exotropia. Constant exotropia may be congenital which is often associated with an underlying neurological anomaly or basic which appears after six months of age with equal exotropia for near and distance vision. Both types are usually treated surgically. Consecutive strabismus can also be a constant exotropia. Intermittent exotropia is the most common form of exotropia. It begins as an exophoria and breaks down to exotropia presenting in children between two and five years of age. It is characterized by worse exotropia at near (convergence excess) or worse exotropia at distance (divergence excess). Treatment includes spectacle correction, orthoptic exercises or surgery. See A pattern; V pattern. strabismus fixus A rare, congenital condition in which one or both eyes are firmly fixed in a position of extreme adduction or abduction, although the most common position is adduction (esotropia). It is due to an anatomical anomaly (e.g. anomalous insertion of the medial or lateral rectus muscle), or muscle fibrosis (e.g. of the two medial recti muscle in esotropia). Voluntary movements of duction and version, as well as passive movements as in the forced duction test, are either absent or insignificant. See forced duction test. incomitant strabismus Strabismus in which the angle of deviation varies with the direction of gaze and with the eye used for fixation. It may be congenital or acquired. The congenital type is due to some developmental anomaly of one or more of the extraocular muscles or of the neural component that serves them. The acquired type may be due to head injury, disease of the oculomotor system, or systemic disease (e.g. multiple sclerosis, myasthenia gravis, thyroid eye disease, aneurysms). The main symptom of incomitant strabismus is diplopia and it suddenly appears in the acquired type. Abnormal head posture and past-pointing may be present. The affected muscle(s) may be detected by the motility test. Treatment is aimed first at the primary cause but, in general, this type of strabismus does not respond well to orthoptic procedures. In large deviation, surgery is usually the only remedy. Syn. nonconcomitant strabismus. See abnormal head posture; incomitance; pointing past-; Hess screen; paralytic strabismus; motility test. infantile strabismus Strabismus which becomes manifest within the first year of life. It is almost always esotropic in nature: exotropia, which is very rare, is usually associated with some neurological condition. Infantile strabismus is characterized by a large angle of squint, hyperopia, alternate fixation that may become unilateral if amblyopia develops, and nystagmus. Management is essentially surgical after correction of the refractive error. A complication following surgery may be dissociated vertical deviation. Syn. congenital strabismus; infantile esotropia syndrome. See cross-fixation. intermittent strabismus Strabismus that is not present at all times. monocular strabismus See unilateral strabismus. non-accommodative strabismus Convergent strabismus not due to abnormal demands on accommodation. There are several types: infantile strabismus, acquired non-accommodative strabismus, basic esotropia (no significant hyperopia and the deviation is equal for near and distance), microtropia, convergence excess (esotropia for near vision but not for distance), divergence insufficiency (esotropia for distance vision but not for near), consecutive strabismus, sensory strabismus and cyclic esotropia (periodic manifestation of esotropia as for example on alternate days). Treatment of associated amblyopia and correction of hyperopia are often followed by surgery. nonconcomitant strabismus See incomitant strabismus. paralytic strabismus Strabismus due to a paralysis of the extraocular muscles. It usually gives rise to incomitance. The paralysis is usually due to a disorder of the third, fourth or sixth cranial nerve. Diplopia is noticed if the paralysis is recent and it is usually accompanied by an abnormal head posture. In most cases there is not a complete loss of action of a muscle but a partial loss and the condition is referred to as paretic strabismus, whether it is congenital or acquired. Orthoptic treatment is very limited in these cases and is not normally appropriate if the deviation was caused by injury or a recent disease. Cosmetic surgery is often necessary. See abnormal head posture; incomitance; paralysis of the fourth nerve; paralysis of the sixth nerve; paralysis of the third nerve; motility test. periodic strabismus Strabismus in which the deviation occurs only at certain distances or in certain directions of fixation. Syn. relative strabismus. relative strabismus See periodic strabismus. secondary s . Strabismus resulting from a sensory deficit, surgical intervention, tumour, trauma or stroke. See consecutive strabismus; sensory strabismus. sensory strabismus Strabismus caused by a unilateral reduction in visual acuity which disrupts binocular vision, such as unilateral cataract, optic atrophy, uncorrected anisometropia or other unilateral visual impairments. small angle strabismus See microtropia. strabismus surgery See myectomy; myotomy; Faden procedure; tuck procedure; recession; resection; transposition. unilateral strabismus Strabismus in which the deviating eye is always the same, as distinguished from alternating strabismus. Syn. monocular strabismus. a manifest deviation of an eye from the normal position when both eyes are open and uncovered. See also strabismus. El cover-uncover test monocular es la prueba mas importante para detectar la presencia de un estrabismo manifiesto y para diferenciar una tropia de una foria (figura 5). Se sugiere realizar este tipo de estudio en personas con problemas de vergencias tipo tropia, no consideradas en esta investigacion. La prueba de oclusion-desoclusion se utiliza para detectar la presencia de estrabismo y diferenciar una tropia de una foria .